Managers may want to reflect on this quote from Harvard Business School dean Nitin Nohria since a Robert Half Management Resources survey of Canadian workers found that many business leaders do, indeed, have some real work to do when it comes to communication. At least, a good percentage of their staff likely think that is the case. 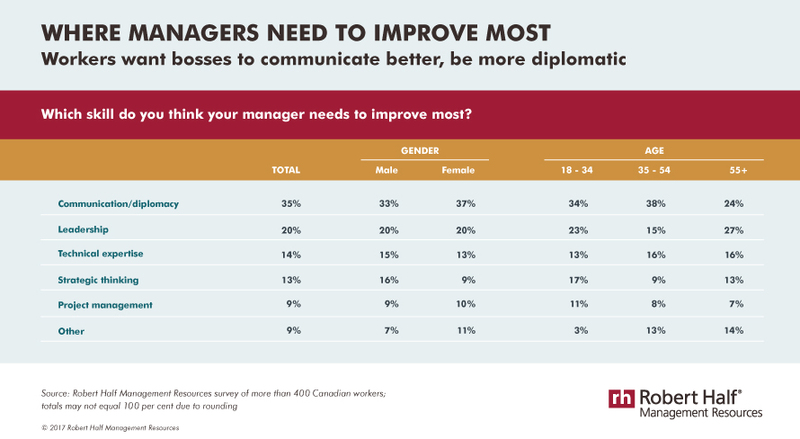 More than one-third (35 per cent) of workers in our survey said communication and diplomacy are the areas where managers need to improve most. The repercussions of poor communication between managers and employees can manifest in many ways — from retention issues to lack of innovation. Which workers seek better communication? Many professionals in this age group are working at the management level, and do not think they need to improve their interpersonal skills. Managers are not reaching out effectively to veteran staff members because they (wrongly) assume these workers already “have the memo” on everything pertinent that’s happening at the firm and also don’t require a lot of feedback on their performance. It’s important to communicate well with all staff members, of course. But our research indicates that business leaders may need to apply special attention to eliminating any disconnect they may have with the youngest millennials and the more seasoned employees on their team. Addressing this issue is important to the long-term health of the business: Millennials represent the largest demographic group in today’s workforce — and retaining them can be challenging for employers. And baby boomer employees, who lend a wealth of hard-to-replace knowledge and experience to businesses, are retiring in greater numbers or pursuing encore careers. If professionals in either group feel that they aren’t receiving enough feedback from, or don’t have a good rapport with, their managers, they may be inclined to leave their current work situation sooner than later. At the same time, don’t forget about Generation X. Research from our company found professionals 35-54 are the least likely to see how their work contributes to the company’s bottom line. Managers who don’t make this connection for staff risk alienating them and making it harder for employees to focus on the greatest priorities for the business. The path to achieving better communication with all employees is, of course, learning how to communicate better as a manager. However, in practice, this isn’t so simple. The real key to improvement is applying a customized approach. That takes work, but it can be well worth it in terms of generating positive benefits for the business. Leaders must be able to tailor their communication style to the individual and recognize what motivates each team member. Ask your manager, peers and employees to give you the straight scoop on your strengths and weaknesses as a communicator. In the process, ask them to share their communication preferences with you. You may learn, for example, that one of your millennial employees would prefer more face time with you. Meanwhile, your manager may like to communicate primarily through email, unless an urgent or sensitive matter arises. Remember, not everyone will be comfortable providing candid feedback — especially if they report to you — so consider gathering anonymous input, too. No doubt you know someone in the organization, or in your professional network, who is an outstanding communicator. Observe how that person interacts with others, especially the employees they manage. Then, apply some of his or her winning techniques to your own communication. Communication is a two-way street. So, part of your work toward improving your communication abilities should be learning how to be a good listener. It’s important to get your points across clearly, but don’t worry so much about delivering your own messages that you don’t hear what employees or other colleagues are trying to communicate to you. Sometimes, people work so hard to be a good manager that they forget about being an individual. The more you demonstrate that you are human — and imperfect, just like everyone else — the more your staff will view you as approachable. Over time, simply being a person your employees can relate to can go a long way toward building open and strong lines of communication with all your staff. Robert Half Management Resources – Areas of Specialization: Whether your organization is expanding, consolidating, restructuring or undergoing a complex systems conversion, or preparing for an IPO, we can provide highly skilled senior-level professionals with extensive experience to help move your business forward. Contact us today.